Proprietary Name: Taltz What is the Proprietary Name? Non-Proprietary Name: Ixekizumab What is the Non-Proprietary Name? Taltz with NDC 0002-1445 is a a human prescription drug product labeled by Eli Lilly And Company. The generic name of Taltz is ixekizumab. The product's dosage form is injection, solution and is administered via subcutaneous form. FDA Application Number: BLA125521 What is the FDA Application Number? Start Marketing Date: 03-22-2016 What is the Start Marketing Date? Why is ixekizumab injection medication prescribed? TALTZ is indicated for the treatment of adult patients with active psoriatic arthritis. The recommended dose is 160 mg by subcutaneous injection (two 80 mg injections) at week 0, followed by 80 mg every 4 weeks. For psoriatic arthritis patients with coexistent moderate-to-severe plaque psoriasis, use the dosing regimen for plaque psoriasis [see Dosage and Administration (2.1)]. TALTZ may be administered alone or in combination with a conventional disease-modifying antirheumatic drug (cDMARD) (e.g., methotrexate). TALTZ may increase the risk of infection. In clinical trials in patients with plaque psoriasis, the TALTZ group had a higher rate of infections than the placebo group (27% vs. 23%). Upper respiratory tract infections, oral candidiasis, conjunctivitis and tinea infections occurred more frequently in the TALTZ group than in the placebo group. A similar increase in risk of infection was seen in placebo-controlled trials in patients with psoriatic arthritis [see Adverse Reactions (6.1)]. Serious hypersensitivity reactions, including angioedema and urticaria (each ≤0.1%), occurred in the TALTZ group in clinical trials. Anaphylaxis, including cases leading to hospitalization, has been reported in post marketing use with TALTZ [see Adverse Reactions (6.1, 6.3)]. If a serious hypersensitivity reaction occurs, discontinue TALTZ immediately and initiate appropriate therapy. Prior to initiating therapy with TALTZ, consider completion of all age appropriate immunizations according to current immunization guidelines. Avoid use of live vaccines in patients treated with TALTZ. No data are available on the response to live vaccines. Injection Site ReactionsThe most frequent injection site reactions were erythema and pain. Most injection site reactions were mild-to-moderate in severity and did not lead to discontinuation of TALTZ. InfectionsIn the 12-week, placebo-controlled period of the clinical trials in plaque psoriasis, infections occurred in 27% of subjects treated with TALTZ (1.2 per subject-year of follow-up) compared to 23% of subjects treated with placebo (1.0 per subject-year of follow-up). Serious infections occurred in 0.4% of subjects treated with TALTZ (0.02 per subject-year of follow-up) and in 0.4% of subjects treated with placebo (0.02 per subject-year of follow-up) [see Warnings and Precautions (5.1)]. Active Comparator TrialsIn the two clinical trials that included an active comparator, the rate of serious adverse events during weeks zero to twelve was 0.7% for U.S. approved etanercept and 2% for TALTZ 80 mg Q2W, and the rate of discontinuation from adverse events was 0.7% for U.S. approved etanercept and 2% for TALTZ 80 mg Q2W. The incidence of infections was 18% for U.S. approved etanercept and 26% for TALTZ 80 mg Q2W. The rate of serious infections was 0.3% for both TALTZ 80 mg Q2W and U.S. approved etanercept. Psoriatic ArthritisTALTZ was studied in two placebo-controlled trials in patients with psoriatic arthritis. A total of 678 patients were studied (454 patients on TALTZ and 224 on placebo). A total of 229 patients in these trials received TALTZ 160 mg at Week 0, followed by 80 mg every 4 weeks (Q4W). Overall, the safety profile observed in patients with psoriatic arthritis treated with TALTZ Q4W is consistent with the safety profile in patients with plaque psoriasis with the exception of the frequencies of influenza (1.3%) and conjunctivitis (1.3%). Plaque Psoriasis PopulationBy Week 12, approximately 9% of subjects treated with TALTZ every 2 weeks developed antibodies to ixekizumab. Approximately 22% of subjects treated with TALTZ at the recommended dosing regimen developed antibodies to ixekizumab during the 60-week treatment period. The clinical effects of antibodies to ixekizumab are dependent on the antibody titer; higher antibody titers were associated with decreasing drug concentration and clinical response. Psoriatic Arthritis PopulationFor subjects treated with TALTZ 80 mg every 4 weeks for up to 52 weeks (PsA1), 11% developed anti-drug antibodies, the majority of which were low titer, and 8% had confirmed neutralizing antibodies. Risk SummaryThere are no available data on TALTZ use in pregnant women to inform any drug associated risks. Human IgG is known to cross the placental barrier; therefore, TALTZ may be transmitted from the mother to the developing fetus. An embryofetal development study conducted in pregnant monkeys at doses up to 19 times the maximum recommended human dose (MRHD) revealed no evidence of harm to the developing fetus. When dosing was continued until parturition, neonatal deaths were observed at 1.9 times the MRHD [see Data]. The clinical significance of these nonclinical findings is unknown. Animal DataAn embryofetal development study was conducted in cynomolgus monkeys administered ixekizumab. No malformations or embryofetal toxicity were observed in fetuses from pregnant monkeys administered ixekizumab weekly by subcutaneous injection during organogenesis to near parturition at doses up to 19 times the MRHD (on a mg/kg basis of 50 mg/kg/week). Ixekizumab crossed the placenta in monkeys. Risk SummaryThere are no data on the presence of ixekizumab in human milk, the effects on the breastfed infant, or the effects on milk production. Ixekizumab was detected in the milk of lactating cynomolgus monkeys. The developmental and health benefits of breastfeeding should be considered along with the mother's clinical need for TALTZ and any potential adverse effects on the breastfed infant from TALTZ or from the underlying maternal condition. AbsorptionFollowing a single subcutaneous dose of 160 mg in subjects with plaque psoriasis, ixekizumab reached peak mean (±SD) serum concentrations (Cmax) of 16.2 ±6.6 mcg/mL by approximately 4 days post dose. DistributionThe mean (geometric CV%) volume of distribution at steady-state was 7.11 L (29%) in subjects with plaque psoriasis. EliminationThe metabolic pathway of ixekizumab has not been characterized. As a humanized IgG4 monoclonal antibody ixekizumab is expected to be degraded into small peptides and amino acids via catabolic pathways in the same manner as endogenous IgG. WeightIxekizumab clearance and volume of distribution increase as body weight increases. Dose LinearityIxekizumab exhibited dose-proportional pharmacokinetics in subjects with plaque psoriasis over a dose range from 5 mg (not the recommended dose) to 160 mg following subcutaneous administration. Age: Geriatric PopulationPopulation pharmacokinetic analysis indicated that age did not significantly influence the clearance of ixekizumab in adult subjects with plaque psoriasis. Subjects who are 65 years or older had a similar ixekizumab clearance as compared to subjects less than 65 years old. Renal or Hepatic ImpairmentNo formal trial of the effect of hepatic or renal impairment on the pharmacokinetics of ixekizumab was conducted. Drug Interaction StudiesDrug interaction studies have not been conducted with TALTZ. Clinical Response at Week 12The results of Trials 1, 2, and 3 are presented in Table 2. Table 2: Efficacy Results at Week 12 in Adults with Plaque Psoriasis in Trials 1, 2, and 3; NRIaa Abbreviations: N = number of patients in the intent-to-treat population; NRI = Non-Responder Imputation. Maintenance and Durability of ResponseTo evaluate the maintenance and durability of response, subjects originally randomized to TALTZ and who were responders at Week 12 (i.e., sPGA of 0 or 1) in Trial 1 and Trial 2 were re-randomized to an additional 48 weeks of either a maintenance dose of TALTZ 80 mg Q4W (every 4 weeks) or placebo. Non-responders (sPGA >1) at Week 12 and subjects who relapsed (sPGA ≥3) during the maintenance period were placed on TALTZ 80 mg Q4W. 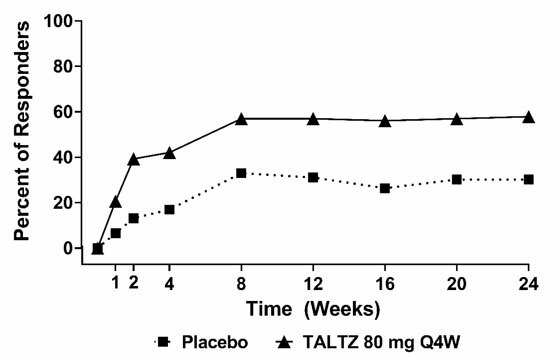 Clinical ResponseIn both studies, patients treated with TALTZ 80 mg Q2W or 80 mg Q4W demonstrated a greater clinical response including ACR20, ACR50, and ACR70 compared to placebo at Week 24 (Table 3). In PsA2, responses were seen regardless of prior anti-TNFα exposure. Table 3: Responsesa at Week 12 and 24; NRIba Patients who met escape criteria (less than 20% improvement in tender and swollen joint counts) at Week 16 or had missing data at Week 24 were considered non-responders at Week 24.
in PsA1 Through Week 24a Patients who met escape criteria (less than 20% improvement in tender and swollen joint counts) at Week 16 or had missing data at Week 24 were considered non-responders at Week 24. The improvements in the components of the ACR response criteria are shown in Table 4. Radiographic ResponseRadiographic changes were assessed in PsA1. Inhibition of progression of structural damage was assessed radiographically and expressed as the change in modified total Sharp score (mTSS) at Week 16, compared to baseline. The total Sharp score was modified for psoriatic arthritis by addition of hand distal interphalangeal (DIP) joints. Physical FunctionTALTZ treated patients showed improvement in physical function compared to patients treated with placebo as assessed by the Health Assessment Questionnaire-Disability Index (HAQ-DI) at Week 12 and 24. In both studies, the proportion of HAQ-DI responders (≥0.35 improvement in HAQ-DI score) was greater in the TALTZ 80 mg Q4W groups compared to placebo at week 12 and 24. Other Health-Related OutcomesGeneral health status was assessed by the Short Form health survey (SF-36). At Week 12 in PsA1 and PsA2, patients treated with TALTZ showed greater improvement from baseline in the SF-36 physical component summary (PCS) score compared to patients treated with placebo but this improvement was not consistent in both studies for the SF-36 mental component summary (MCS) score. At Week 12, there was consistent evidence of effect in the physical-functioning, role-physical, bodily-pain, and general health domains but not in the social-functioning, role-emotional, vitality, and mental health domains. Eli Lilly and Company, Indianapolis, IN 46285, USAUS License Number 1891Product of IrelandCopyright © 2016, 2018, Eli Lilly and Company. All rights reserved. If needed, patients/caregivers may store TALTZ at room temperature up to 30°C (86°F) for up to 5 days in the original carton to protect from light. Once TALTZ has been stored at room temperature, do not return to the refrigerator and discard, if unused, within 5 days.Record the date when TALTZ is first removed from the refrigerator in the spaces provided on the carton.For the 2 or 3 autoinjector pack, remove a single autoinjector at a time leaving the remaining autoinjector(s) in the original carton in the refrigerator. Ensure the unrefrigerated TALTZ is protected from light. (tolts)(ixekizumab)injection, for subcutaneous useWhat is the most important information I should know about TALTZ?TALTZ is a medicine that affects your immune system. TALTZ may lower the ability of your immune system to fight infections and may increase your risk of infections, which can sometimes become serious.Your healthcare provider should check you for tuberculosis (TB) before you start treatment with TALTZ. After starting TALTZ, call your healthcare provider right away if you have any of the symptoms of infection listed above.Do not use TALTZ if you have any symptoms of infection unless you are instructed to by your healthcare provider.See “What are the possible side effects of TALTZ?” for more information about side effects. With active psoriatic arthritis. TALTZ can be used alone or with the medicine methotrexate.It is not known if TALTZ is safe and effective in children under 18 years of age. Do not use TALTZ if you have had a severe allergic reaction to ixekizumab or any of the other ingredients in TALTZ.See the end of this Medication Guide for a complete list of ingredients in TALTZ. Are breastfeeding or plan to breastfeed. It is not known if TALTZ passes into your breast milk.Tell your healthcare provider about all the medicines you take, including prescription and over-the-counter medicines, vitamins, and herbal supplements. How should I use TALTZ?See the detailed “Instructions for Use” that comes with your TALTZ for information on how to prepare and inject a dose of TALTZ, and how to properly throw away (dispose of) used TALTZ autoinjectors and prefilled syringes.Use TALTZ exactly as prescribed by your healthcare provider. If you forget to take your dose:Do not miss any doses of TALTZ unless your healthcare provider says it is okay. If you forget to take your TALTZ dose, inject a dose as soon as you remember. Then, take your next dose at your regular scheduled time. How should I store TALTZ?Protect TALTZ from light. Do not shake TALTZ.Keep TALTZ and all medicines out of the reach of children.General information about the safe and effective use of TALTZ.Medicines are sometimes prescribed for purposes other than those listed in a Medication Guide. Do not use TALTZ for a condition for which it was not prescribed. Do not give TALTZ to other people, even if they have the same symptoms you have. It may harm them. You can ask your healthcare provider or pharmacist for information about TALTZ that is written for health professionals. INSTRUCTIONS FOR USETALTZ® (tol(t)s)(ixekizumab)injection, for subcutaneous useAutoinjectorBefore you use the TALTZ autoinjector, read and carefully follow all the step-by-step instructions.Important information:Your healthcare provider or nurse should show you how to prepare and inject TALTZ using the autoinjector. Do not inject yourself or someone else until you have been shown how to inject TALTZ. Each TALTZ autoinjector contains 1 dose of TALTZ. The autoinjector is for one-time use only.The autoinjector contains glass parts. Handle autoinjector carefully. If you drop it on a hard surface, do not use it. Use a new TALTZ autoinjector for your injection. INSTRUCTIONS FOR USEBefore you use the TALTZ autoinjector, read and carefully follow all the step-by-step instructions.Parts of the TALTZ autoinjector1Get Ready1aTake the TALTZ autoinjector from the refrigerator.Remove the autoinjector from the package. Put the original package with any unused autoinjectors back in the refrigerator. 1 sharps disposal container. See “Dispose of the used autoinjector.”1cInspect the autoinjector.Make sure the name TALTZ appears on the label. Do not use the autoinjector, and dispose of as directed by your healthcare provider or pharmacist if:the expiration date printed on the label has passed. 1dWash your hands with soap and water before you inject TALTZ.1eChoose your injection site.You may inject in your stomach area (abdomen) or in your thigh, or in the back of your arm. To inject in your arm, you will need someone to help you.Do not give an injection into areas where the skin is tender, bruised, red or hard, or in an area of skin that is affected by psoriasis.Do not inject within 1 inch of the navel (belly button).Alternate your injection sites.Do not inject in the exact same spot every time. For example, if your last injection was in your left thigh, your next injection should be in your right thigh, your abdomen, or the back of either arm. 1fPrepare your skin. Clean your injection site with an alcohol wipe. Let the injection site dry before you inject TALTZ. 2Inject TALTZ2aMake sure the lock ring is in the lock position.Leave the base cap on until you are ready to inject. Twist off the base cap in the direction of the arrows.Throw the base cap in the trash. You will not need to put the base cap back on. If you do, you could damage the needle or stick yourself by accident. 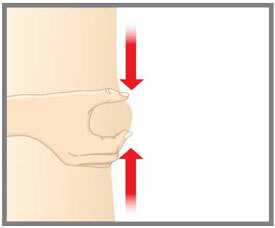 2bPlace the clear base flat and firmly against your skin at the injection site.2cWhile holding the clear base against your skin, turn the lock ring to the unlock position. You are now ready to inject. 2dPress the green injection button. There will be a loud click.Keep holding the clear base firmly against your skin. You will hear a second click in about 10 seconds after the first one. 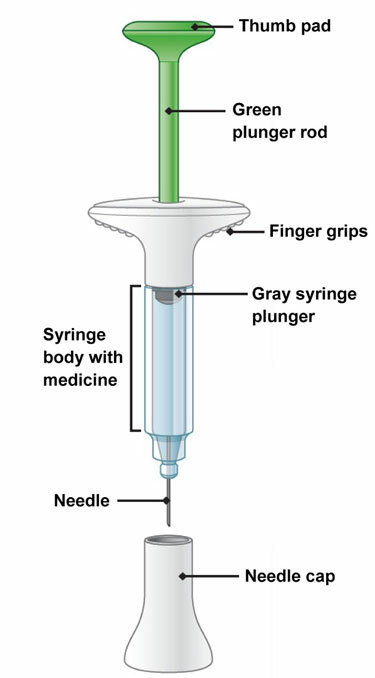 The second click tells you that your injection is complete.You will see the gray plunger at the top of the clear base. Remove the autoinjector from your skin.Press a cotton ball or gauze over the injection site. Do not rub the injection site, as this may cause bruising. You may have slight bleeding. This is normal.Do not put the base cap back on the autoinjector. 3Dispose of (throw away) the used autoinjector.3aPut the used TALTZ autoinjector in a FDA-cleared sharps disposal container right away after use. Do not throw away (dispose of) the TALTZ autoinjector in your household trash. Q.What if I see bubbles in the TALTZ autoinjector?A.It is normal to have air bubbles in the autoinjector. Q.What if there is a drop of liquid on the tip of the needle when I remove the base cap?A.It is okay to see a drop of liquid on the tip of the needle. Q.What if I unlocked the autoinjector and pressed the green injection button before I twisted off the base cap?A.Do not remove the base cap. Dispose of the autoinjector and get a new one. Q.Do I need to hold the injection button down until the injection is complete?A.You do not need to hold the injection button down, but it may help you keep the autoinjector steady and firm against your skin. Q.What if the needle did not retract after my injection or I am not sure that the autoinjector worked in the right way?A.Do not touch the needle or replace the base cap. Store the autoinjector in a safe place (e.g., a household container as described in “Dispose of the used autoinjector.”) to avoid an accidental needlestick and contact Lilly (1-800-545-5979) for instructions on how to return the autoinjector. Q.What if I hear more than 2 clicks during my injection? Did I get my complete dose?A.You may hear a soft click right before the second loud click. This is the normal operation of the autoinjector. Do not remove the autoinjector from your skin until you hear the second loud click. 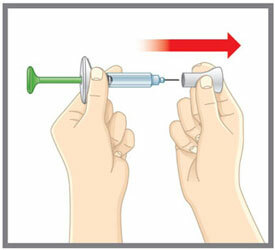 Q.How can I tell if my injection is complete?A.After you press the green injection button, you will hear 2 loud clicks. The second click tells you that your injection is complete. You will also see the gray plunger at the top of the clear base. How should I store TALTZ autoinjector?Protect TALTZ from light. Read the full Prescribing Information and Medication Guide for TALTZ inside this box to learn more about your medicine.This Instructions for Use has been approved by the U.S. Food and Drug Administration. INSTRUCTIONS FOR USETALTZ® (tol(t)s)(ixekizumab)injection, for subcutaneous usePrefilled SyringeBefore you use the TALTZ prefilled syringe, read and carefully follow all the step-by-step instructions.Important information:Your healthcare provider or nurse should show you how to prepare and inject TALTZ using the prefilled syringe. Do not inject yourself or someone else until you have been shown how to inject TALTZ. 1aTake the TALTZ prefilled syringe from the refrigerator.Remove the prefilled syringe from the package. Put the original package with any unused syringes back in the refrigerator. Leave the needle cap on the syringe until you are ready to inject.Wait 30 minutes to let the prefilled syringe warm to room temperature before you use it. 1cInspect the syringe. Leave the needle cap on the syringe until you are ready to inject.Make sure the name TALTZ appears on the label. 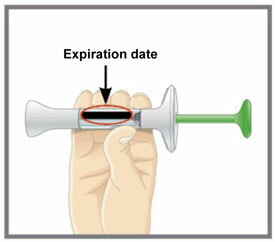 Do not use the prefilled syringe, and dispose of as directed by your healthcare provider or pharmacist if:the expiration date printed on the label has passed. 1dWash your hands with soap and water before you inject TALTZ. 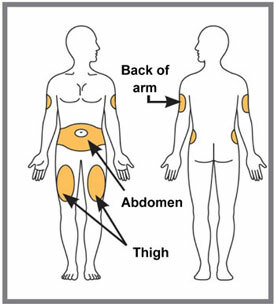 1eChoose your injection site.You may inject in your stomach area (abdomen) or in your thigh, or in the back of your arm. To inject in your arm, you will need someone to help you.Do not give an injection into areas where the skin is tender, bruised, red or hard, or in an area of skin that is affected by psoriasis.Do not inject within 1 inch of the navel (belly button).Alternate your injection sites.Do not inject in the exact same spot every time. For example, if your last injection was in your left thigh, your next injection should be in your right thigh, your abdomen, or the back of either arm. 2aPull the needle cap off and throw it away.Do not put the needle cap back on. You could damage the needle or stick yourself by accident. 2bGently pinch and hold a fold of skin where you will inject. 2cInsert the needle at a 45-degree angle. Then gently let go of your skin. Make sure to keep the needle in place. 2dPush in the plunger.Slowly push on the thumb pad to push the plunger all the way in until all the medicine is injected. 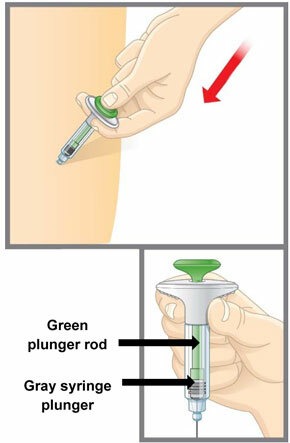 You should see the green plunger rod show through the syringe body when the injection is complete.Gently remove the needle from your skin. 3Dispose of (throw away) the used prefilled syringe. 3aPut the used TALTZ prefilled syringe in a FDA-cleared sharps disposal container right away after use. 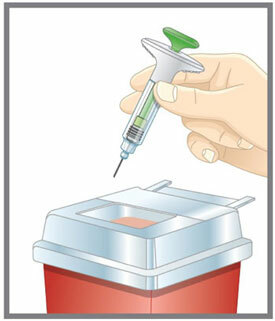 Do not throw away (dispose of) the TALTZ prefilled syringe in your household trash. Q.What if I see air bubbles in my TALTZ prefilled syringe?A.It is normal to have air bubbles in the prefilled syringe. Q.What if there is a drop of liquid on the tip of the needle when I remove the needle cap?A.It is okay to see a drop of liquid on the tip of the needle. How should I store TALTZ prefilled syringe?Protect TALTZ from light.